It’s the off-season for many, the holidays are here, and many will have a break over the winter! Maybe it’s cold outside, maybe it’s raining or snowing, no matter there are plenty of opportunities to keep improving your skills indoors or outdoors! So on that, note we begin a series of skill tutorials. This month’s starting video begins with a familiar topic and is quite simple: juggling. How and why! Let’s look at this skill through the eyes of a freestyler and how we use the basics to setup the more complex. Two common mistakes seen in youth players learning to juggle are the following: 1) Lifting the leg too high resulting in the ball climbing to chest or head height, and 2) inefficiently extending the leg too far on each touch. 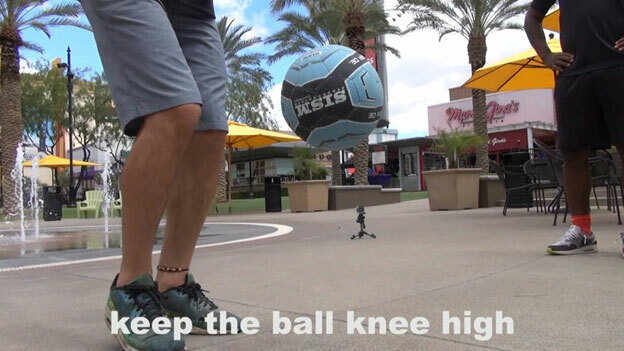 As a freestyler it is important to be able to juggle the ball around knee-high so setup your next trick. So many of the skills we challenge ourselves with first require this basic control as our starting point. Don’t forget, you must be able to use both feet for this! What’s a freestyler’s point of view on this? If your dominant foot is the one that’s about to execute your best trick, it’s your non-dominant foot that often sets up the final touch just before! No control on your weak foot = no big tricks with your good foot! Click here for the rest of my article and more tips!